The original means of communicating via radio was telegraphy, using the International Morse Code. International Morse Code uses a system of dots and dashes, similar to the earlier American Morse Code used over landlines by railways and telegraph companies. Most countries no longer require amateur radio operators to be proficient in Morse Code, but many radio amateurs continue to use Morse. Nostalgia may be one reason, but Morse is also highly efficient. Morse signals can often be heard when conditions are not adequate for other modes, and a highly evolved set of abbreviations can be understood across language barriers. Most of the Morse you will hear on the amateur bands is probably in the range of 15-20 words per minute. But there are many operators who can send and receive at over 40 words per minute. It is also possible to send Morse from a computer keyboard and receive it automatically on a computer screen – but where’s the fun in that? 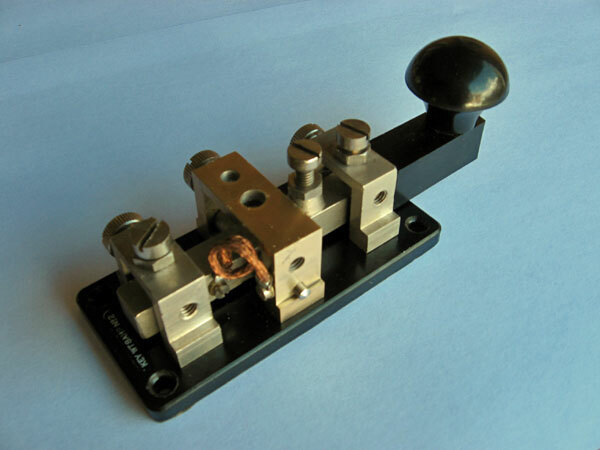 For some of us, telegraph keys are objects of beauty. Indeed, some of the rarer models are quite valuable. I have just a few keys (or, as I like to call them, “digital communication devices”) most of which I have actually used over the years in amateur radio. » For more information see the Morse Code sites listed on the Links Page.